Since I also have a major soft spot for pastries in this town, I’ve also paired my tasting with side orders of cakes and tarts and the likes. Altogether they are packing some calorific punches but let’s not worry about that for now. I’ll offset them at some point with jogging sessions at Luco. In the mean time, please find my current favourite hot chocolate salons. First tested just before Christmas last year, I find myself looking for excuses to go back there. This place is the epitome of minimalist chic, and the hot chocolate is served in a rather peculiarly tall jug with wooden stirer that resembles a honey dipper! For anyone who can’t make up his/her mind on the accompanying pastry, there’s chocolat gourmand to be had. The last time I ordered this, a slate with four mini yet delicious pastries graced the table. Yum. Its location next to Odéon means this place is super convenient for me to get to. 15-20 minutes walk from home perhaps? The salon du thé of Jacques Genin is by no mean large, and they do not try to “maximise” the seating arrangement by squeezing the tables close to one another either. As a result, there’s an ambiance of zen while one takes the time to enjoy the hot beverage on offer. Granted, if you’re one of the few queueing for one of the 8-9 tables this could translate to a relatively long waiting time. Genin is also famous for its assemble-to-order millefeuille (they’re a tad delicate to take away) and there are other selection of pastries to accompany the hot chocolate too. On the way out, grab a small sachet of soft caramel. They are incredible and really don’t last long chez moi. A couple of days, top. As much as I like Genin, a recent incident has, for now, dampened any desire for me to cross town to Haut Marais for a visit to its tearoom. Located at the back of St-Gervais-et-St-Protais church, the calm street where Ebouillanté is situated wins, hands down, for quaint view that you can lose yourself in. On a cold but sunny late afternoon, I love it best if I manage to snag a table inside, downstairs, and by the window. Hot chocolate here is served in a bowl with petal motifs made out of ganache-thick chocolate, accompanied with a jug of hot milk. Pour the milk in, stir, and savour. Just something to be aware of – the minimum amount chargeable to carte bleue is fairly high so unless you’re pooling payments between a few people on a card, you really should have some cash with you. Good hot chocolate may be expensive, but a single person is unlikely to spend over 20euro during tea time, even with a pastry added to the order. 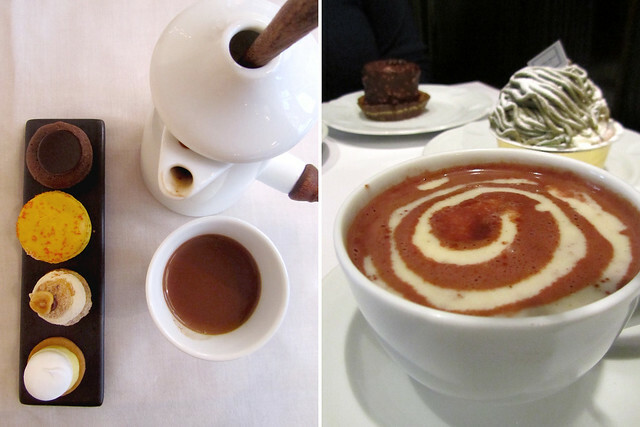 A mere minutes walk away from Angelina on rue St Honoré, JP Hévin’s hot chocolate bar has more options than any of the other places aforementioned. There are a dozen or so variety on offer (including chocolat chaud aux huitres!) so choosing is a lot trickier here. Any accompanying pastry must be ordered downstairs before heading up the spiralling and narrowing stairs to the spacious double room for a table. If you are seated at the bar area, you’ll even watch the preparation in action. Winter has just started and there would be more opportunities to indulge in a few more cups of chocolat chaud in the coming months. I’ll keep you updated on another round-up soon! Ps: average bill, per person, for hot chocolate and pastry is about €13-15. omg, it all looks proper fattening!